This year, I wanted to come up with some new positive life projects. In 2014, I made a Good Things Jar and every day, I wrote down at least one good thing that happened that day (usually more) on scrapbooking paper. There was some decorating, and the jar itself was decorated. It was a wonderful project – one I continued in 2015. But I wanted something else. As an avid scrapbooking fan and someone who is constantly making her own new art projects, I was looking for something daily, that was also artsy and decorating related, and would bring positivity into my life. I decided to make my goal to find a planner that was cute and customizable, and that I would write everything good in it each day (along with my jar) and I would decorate it. 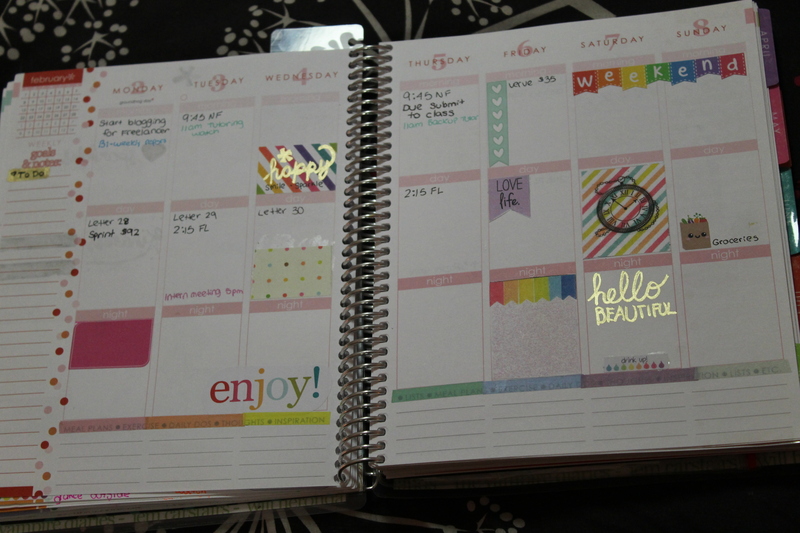 I met the Erin Condren Life Planner via my Instagram obsession. Erin Condren’s website is here, and you can use this link to get $10 off your purchase! 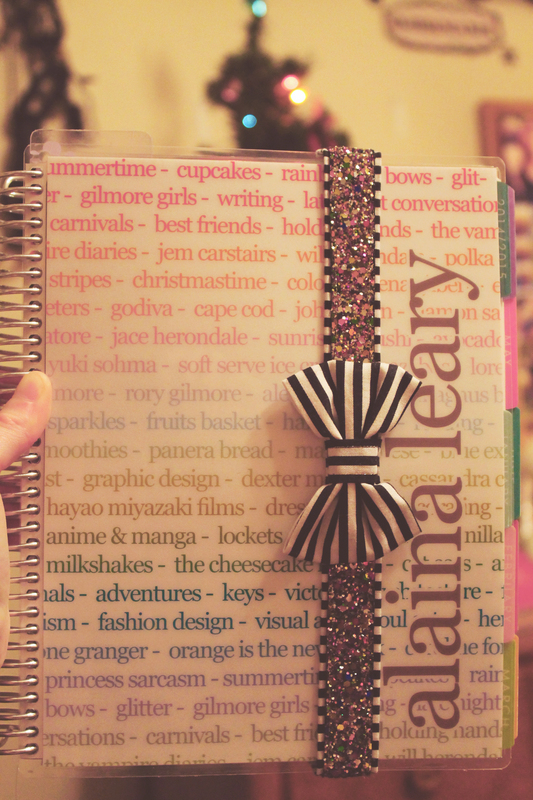 The above photo is of the cover of my Life Planner, with my Katiebowhead planner band on it. I chose the Favorite Things design because I’m obsessed with rainbow and lists, and this combined all my favorite things, literally, into one cover. Every week, I plan out all of my appointments each day, including work and class. I write down reminders. I have a list of weekly to-do’s, and I also record things I do for fun – play games with friends, go on a date, etc. At the bottom of each day, I write a quote, a thought, or the good things that happened that day. Often inside jokes and friends’ funny quotes make it in. I make good use of my scrapbooking paper, stickers, colorful pens and gold leaf to decorate. Early in the process, my weeks get good use of new stickers I buy in that time period, as well as my random decorations, and the beginning process of my appointments and obligations for that week. As the week nears closer, I’ll fill it up with more scrapbooking paper, stickers, and handmade art. I also utilized the Notes section. I keep my important things to remember in there (like monthly bills and the Netflix password), a list of project ideas, my wish list to buy, and my favorite quotes. So far, although it’s only been a few weeks in, this has been a successful project. I think the Erin Condren planner is perfectly suited to my needs, with just enough space for each day and weekly to-do’s. There are also monthly spreads that I use mainly to track important dates and bills, and then to decorate on a monthly theme (like the New Year or my birthday). The planner comes with a folder in the back and a sealable clear pocket for keeping trinkets, which I use to store stickers and other supplies. Go now, and purchase a Life Planner at ErinCondren.com! 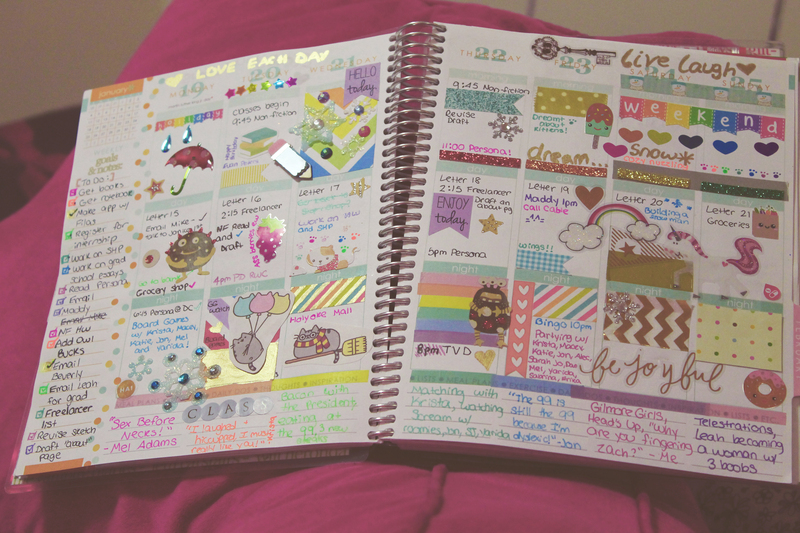 This blog post isn’t a review, but if it was, I would give Erin Condren planners an honest 5 stars. And get a Katiebowhead planner band to match, as they are amazingly beautiful! And if you’re looking for cute bookmarks and dashboards for your EC life planner, check out my Etsy shop here.